Philadelphia, Pennsylvania is a city full of America’s history and culture. Whether you visit alone or with the whole family, you don’t have to break the bank to enjoy all Philadelphia has to offer. Here are some great places you can visit for free. Planning a trip to Philadelphia? Check out Trusted Tours for discount tickets to top Philly tours and attractions. Independence Hall is the home of the Declaration of Independence and the United States Constitution. Take a guided tour and step back in time to explore the history of our country. You can see the actual inkstand that was used to sign the Declaration, and an original draft of the constitution. 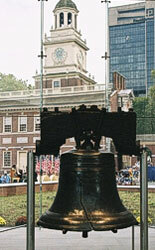 See the one of a kind Liberty Bell and learn the history of the ominous crack. The Edgar Allen Poe Site is the residence where the famous writer lived for a short time of his life. While living here, he wrote “The Black Cat”, which coincidently involves a basement much like the one located in this Philadelphia home. Three of his famous works were also published while he lived here. You an tour the home and see what may have brought on some of Poe’s ideas and perhaps what stirred his imagination. Smith Kids Play Place is an excellent attraction if you have children ten and under. Totally free and full of tons of activities for the kids. There’s a tot spot for the little ones, and a 24,000 square foot playhouse for everyone to enjoy. That’s as big as six football fields! Plenty of hands on interactive things to let them go wild. The mansion is also opened to the public and is a kid’s wonderland of toys. Even if you don’t have children, the mansion is a beautiful home to see. Most everyone has seen the “Rocky” movies, or at least heard of Rocky. Outside the Museum of Art you will see the famous statue of Rocky himself. Pose for a picture and be one of the many who take the famous run up the stairs, jump and do the pose. It doesn’t have much to do with Philadelphia’s history, but for a movie buff it is a fun time. This historic building was designed in 1845 and declared a National Historic Landmark in 1977. It houses design history and architecture from 1800-1945. Hundreds of thousands of drawings, manuscripts and photographs can be viewed here.